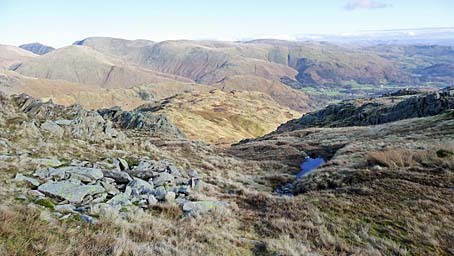 Tarn Crag appears in the centre of the picture. On the horizon, from the left, lie Dollywaggon Pike, St Sunday Crag, Seat Sandal with Cofa Pike and Fairfield beyond, Hart Crag, Great Rigg, Dove Crag and High Street. To the right of that the fells are indistinct. Helm Crag appears in the middle distance beyond Tarn Crag. The village of Grasmere appears in the valley. Larger version of this picture.